This cereal is a combination of flax-infused whole grain flakes and clusters with oats and freeze-dried strawberry and raspberry pieces, and it's pretty good stuff. The most dominate flavor in this cereal is strawberry which is present in every bite. You can taste raspberry if you really concentrate, but those pieces seem to add depth to the strawberry flavor as opposed to being their own flavor element. As you might expect, the flakes have a whole grain flavor and, on the whole, this cereal is more suited to health-conscience adults than to sugar-craving youngsters. However, there is a light sweetness to Red Berry Crunch and the berry flavor can be tasted in the flakes even when eaten dry. With a little luck, you might be able to get a strawberry-loving kid to go for this adult cereal. As for the crunch in Red Berry Crunch, I call it a "gentle crunch". You won't hear a crunch when you eat it. But by the strictest definition of "crunch", you'll have to admit there's something there that qualifies as "crunch", albeit very subtle. As for nutrition, this cereal is a decent choice even though it's nutritional profile isn't as stellar as the packaging might lead you to believe. A 3/4 cup serving has 210 calories, 3.5 grams of fat (0 trans fat and 0.5 saturated fat), 39 grams total carbs, 5 grams dietary fiber, 6 grams protein and 10 grams of sugars. The main selling point, nutritionally, is the flax which provide Omega 3 fatty acids. Overall, I enjoyed this cereal. When it comes to cereals with freeze-dried strawberries, this is one of the better options in the "healthy cereal" category. 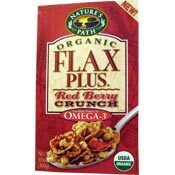 What do you think of Flax Plus Red Berry Crunch? 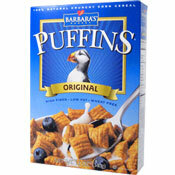 This is a very good cereal! It has a ton of strawberries and raspberries throughout and just tastes like berries in every bite. Healthy and tasty! I am addicted to this cereal. This is the first Healthy Cereal I've tried. I have a bowl of it a day. It is YUMMY! I seem to have trouble finding it in stores and I am planning on buying a case of it. The down fall is the box isn't big enough. You can only get about 3 bowls of cereal out of one box. The flax keeps you regular which is a huge plus!! This cereal has bursts of flaver in every bite. I have told all of my friends about this cereal. I've never been so excited about a cereal before. Go out and buy a few boxes you won't be disapointed.